Israeli start-up Humavox has announced a new hardware platform that uses radio frequency (RF) to transmit power wirelessly to mobile devices. Humavox’s Eterna platform is aimed at making it simpler to charge wearable devices such as hearing aids, smartwatches and augmented reality glasses. The wireless charging market – small as it is — is dominated by companies that today offer products that use electromagnetic fields to create a link to transfer power without cords. As of yet, the marketplace has not settled on an industry standard, though groups have taken positions behind several specifications. Humavox’s Eterna hardware platform will be sold as intellectual property to device manufacturers so they can integrate the company’s wireless charging element using whatever method works best for them, according to Omri Lachman, founder and CEO of Israel Humavox. 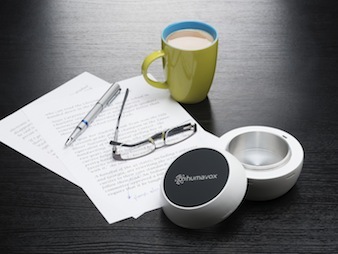 The Humavox technology consists of a “NEST” Station — a design-free RF resonator that charges devices put inside it, with no placement or orientation requirements. 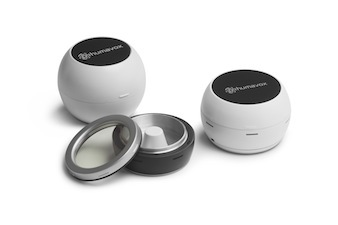 The NEST (i.e., like a bird’s nest) prototype created by Humavox is a white, plastic ball that can be opened to reveal a small charging bowl. Lachman said the device should be able to charge an enabled product in about the same time as with a charging cord. In tests, the technology’s charging efficiency “rarely drops below 90%,” he said, referring to the amount of power lost in the wireless transfer. Humavox’s other enabling technology is ThunderLink, a wireless charging receiver that integrates with a device in a variety of technologies, from PC boards to aftermarket mobile device sleeves to full ASIC (application-specific integrated circuit) integration, meaning there is virtually no engineering required by manufacturers, Lachman said. Lachman compared his company’s RF charging technology to magnetic resonance and inductive charging techniques, saying the latter is more difficult to integrate into mobile products. “With Humavox, there is no longer a need for wires, flat surfaces or precise placement onto power-charging mats — it’s as simple as putting a device of any shape or size into a box,” he said. “The simple way to illustrate how RF charging works is that it’s very similar to how a Wi-Fi router works. “In our case, you have a small unit with an antenna…and it will receive that RF that’s converted into DC energy,” Lachman said. Humavox plans to demonstrate its technology at next month’s CES Conference in Las Vegas. Lachman said his company is in talks with mobile product manufacturers to integrate the technology, but he would not disclose which ones. Humavox’s technology transmits RFs over a broad band of frequency waves and converts it to voltage to wirelessly charge the battery, Lachman said. The technology uses coils similar to those used by magnetic resonance to transmit power, but additionally uses an antenna to establish the transmission connection. Humavox is not alone in the Wi-Fi wireless charging space. After six years of development, start-up Ossia has already demonstrated its Cota wireless charging technology, which it says will be available to consumers and enterprises by 2015. Another company, PowerbyProxi, also has a wireless charging technology that allows users to simply place objects into a box to be charged. Earlier this year, Samsung’s venture funding arm announced it was investing $4 million in the company. The NEST Station wireless charging prototype. PowerbyProxi is a member of the Wireless Power Consortium (WPC) Steering Committee, which is developing standards for wireless charging. Currently, a WPC task force is working to define a wireless power resonant extension to the Qi (pronounced “chee”) specification. Qi is the most widely adopted wireless charging specification today. The Qi specification enables inductive or pad-style charging over short-distance (1.5cm or less) as well as magnetic resonance charging. The Qi specification is supported by 166 companies, including LG Electronics, Sony, Nokia and Verizon Wireless. Another wireless charging group is the Alliance for Wireless Power (A4WP), a consortium founded by Qualcomm and Samsung. That group is focused on bringing wireless charging to tablets and laptops. Gartner analyst Sergis Mushell said the wireless charging market, regardless of the methods used, faces big hurdles ahead of adoption. The first and foremost obstacle is that the industry has yet to settle on a standard. “Any standard that comes in needs the ability to charge devices in a timely manner. You also have to be able to use the device comfortably while it’s charging,” Mushell said. “Lastly, you need a business model that offers an incentive for those who have to deploy the infrastructure to support your charging method. “As long as we have the tail wagging the dog, this will not be successful,” he added. Mushell pointed to coffee shops as an example of why wireless charging has yet to become ubiquitous. Because there’s no current way for them to make money by deploying the technology, any rollout remains a difficult sell. Mushell pointed to Bluetooth as a good example of the industry coming to terms over a standard, in that Bluetooth is now the ubiquitous short-distance communications specification for electronic devices. “There has been development of wireless charging technology for the past two years and it’s still probably only a $30 million market,” Mushell said. Lachman said his RF wireless charging technology differs from others in that it will be more natural for users to simply drop an object, such as a hearing aid or a smartphone into a bowl rather than having to place it on a pad in a precisely oriented manner. However, many of today’s electromagnetic charging technologies allow for “loose coupling” of devices, so that an enabled mobile device simply needs to placed within a specified perimeter — say, on a desktop surface, for example. However, Mushnell believes wireless charging is pointless in the home, where wired charging is just as simple. “If I’m in my home, I can happily plug in. It’s when I’m traveling that I may want to use a charging pad,” he said. Lachman disagreed, saying his NEST prototype allows multiple devices to charge at the same time without dealing with wires. “Obviously, the IP is not around putting things in box, but being able to transmitting RF in a controlled way to any number of devices,” he said.